It’s going to be an EPIC season! Our gorgeous home is waiting for you! Located just minutes from Vail Village, you will find La Casa Vista Vail, our 2500 square foot, custom decorated residence is the perfect place to start all of all of your Vail adventures. Live the life of luxury as you enjoy a glass of wine by the fireplace and savor the stunning views! Overlooking the Vail Golf Course, La Casa Vista Vail is a lovely, three-story duplex decorated in warm, woodsy tones accented with stone floors and vaulted ceilings in every room. We are located on a quiet cul-de-sac and have an enclosed garage with additional parking for up to three cars. The kitchen is finished in gourmet style with custom cabinetry, huge granite countertops, three ovens and a trash compactor. We keep the cupboards fully stocked with staples such as flour and sugar so you won't have to spend extra time or money purchasing small quantities of items you need. We also have a full-sized washer and dryer. The dining area has a large table with seating for eight along with an additional breakfast bar area. You will revel in the panoramic views on three sides, from the Gore Range, the Golf Course, and Gold Peak at Vail while enjoying your meal! The living area is furnished with two large seating arrangements. The first area feature comfortable lounging furniture and a view of the large screen TV and the beautiful mountains. The second arrangement focuses on the large fireplace, a perfect place to warm up and enjoy a hot drink after a hard day on the slopes or to read a book after a day hiking in the hills. Each room has a flat-screen TV, and there's DVD players in the living and master. We also offer free high-speed wireless internet access, and SONOS. The house also has air conditioning in each bedroom. The large deck is equipped with an six-person spa and a gas grill. With stunning views (and starry nights!) you might be tempted to spend all of your time in the invigorating bubbles as you sip on your glass of sparkling champagne! The master suite has a king bed with cable TV. The adjoining Master bath is fully appointed with double sinks and a spacious shower with two showerheads. The second and third bedrooms, along with a loft are on the third level. Both are furnished with queen sized beds and the loft has two twins. These share one and a half baths. Hi! We're the Popes. We lived in Vail from 2000 until recently, and still spend our summers in our mountain home. Steve was the publisher of the Vail Daily. He's been involved all over town, from the Chamber of Commerce to Bravo! Vail Music Festival and more. I've been a ski instructor for over 20 years, and am a flight attendant for a major carrier. For several years I covered the non-profits and social scene for The Vail Daily. In other words, we KNOW Vail and what's going on! If you want all the comforts of an elegant home, this your spot. It is truly our second home, and we are very happy to share it with you. Furnished with high end pieces and lovely artwork (the best art is the view from the living area), you will cherish your memories here! La Casa Vista Vail is a home; not a tacky rental property with tacky rental furnishings. The kitchen is fully equipped with top end appliances and cookware. The private spa on the deck is ready for your to soak! the views are spectacular; golf course and water falls. During the winter, sit in the private hot tub and watch the fireworks down the valley in Gold Peak. The living area is very spacious - two full areas for you and your friends. It's home. toilet, shower, Two showerheads, oversized shower. toilet, combination tub/shower, Two sinks separate from toilet/shower area. Gorgeous views of Vail Golf Course and the East Vail waterfalls. Enjoy the views of the golf course, cliffs, and waterfalls. A/C available during summer in all bedrooms. Baseboard heat, heated floors in master bathroom. Plenty of towels and sheets. Fully stocked with spices, baking items and condiments. Seats 6 (to 8) at table, three or bar area. High Definition, flat screens in EVERY ROOM! Full Sonos system throughout. Download the app and play all of your favorites. Lots of movies for the whole family to enjoy! 2 Miles from Vail Village. Tiger River (Hot Springs) 6 person spa on the deck. Great views! Private! The home was beautiful and comfortable. The fully stocked kitchen was great for us being able to make Thanksgiving dinner for our family. The setting was so convenient for walks, snowshoeing and going into Vail Village. Thank you so much! I'm glad you had a wonderful time. You were great guests. Hope you will come back again! We loved staying here. The accommodations were very comfortable. The view was very pretty. The hot tub was fun. Everything was nice and neat. Thanks for sharing your wonderful home. Thank you, Pat, we hope to see you again! we stayed here for spring break and had a great time. 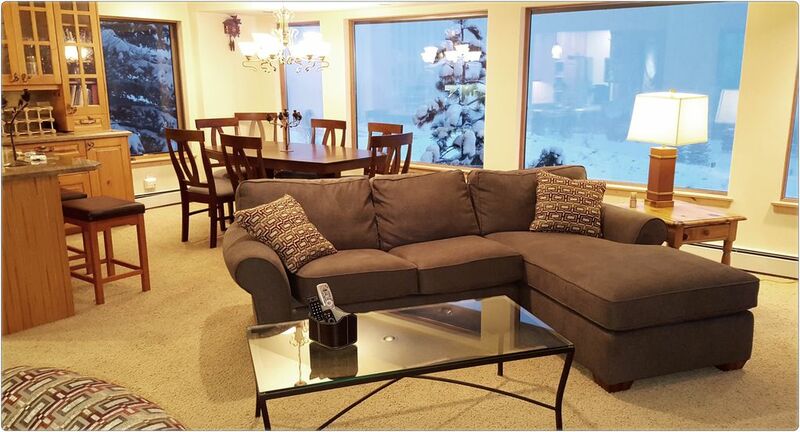 the house is conveniently located; within 5 minutes of Vail village and is completely stocked with everything you need - something I find many HomeAway rentals lack. One more thing - the Sonos system was an added bonus! Thank you for your review! I'm one star short... what should I improve to be a 5 star experience? Very nice home for ski vacation! The house was perfect! It was well stocked in the kitchen, and the hot tub was perfect after hitting the slopes. Perfect distance from Vail village. Would highly recommend!! Thank you very much, Mike! Hope you come back next year! This was a great place to stay, close to Vail, stocked kitchen, and a great hot tub! We will definitely be staying here again! Thank you for opening up your home to my family, friends and I! The spacious home fit all of us along with our 2 dogs very comfortably. The hot tub and grill on the back deck had amazing views of the mountains! Overall, it was a wonderful weekend and we hope to visit again soon!